Sometimes we all need a quick fix when it comes to refreshing our homes. One of the easiest ways to do this is by simply changing out the look of our dining room tables. (And yes, this does mean that first you have to clear off the dining room table so that you can actually see it again). 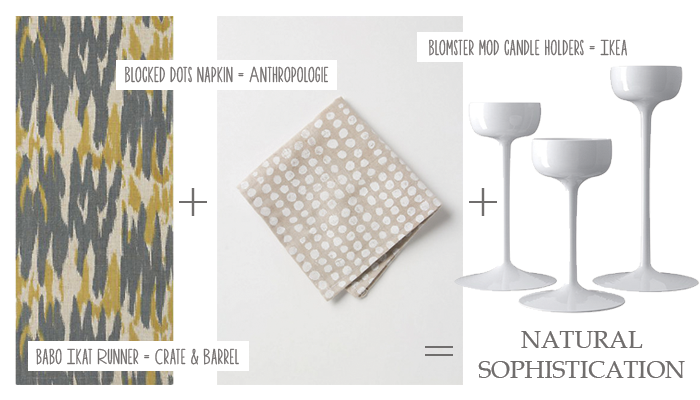 Because we so rarely buy everything at the same place when we’re going for a new look, we thought we’d share some ideas on how we’d mix an match three basic elements from some of our go-to shops.